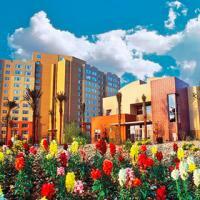 Vacationing at The Grandview at Las Vegas Resort affords you and your family the ultimate in entertainment. Situated less than six miles from the famed Las Vegas Strip, the resort features spacious one-and two-bedroom floor plans and offers easy access to the glitz and glamour of Las Vegas. Take in a fabulous show or court Lady Luck in one of the areas’ famous casinos. Adjacent to South Point Casino, enjoy a meal in one of the many restaurants or create an epicurean delight in your own private kitchen equipped with range, microwave convection oven, full-size refrigerator with ice maker, dishwasher, coffee maker, and toaster. Other accommodation amenities include a washer and dryer in every suite.The Grandview at Las Vegas Resort accommodations are 1,600 square feet of combined living space featuring a common foyer with separate controlled access for each suite. The spacious one- and two-bedroom accommodations are designed for the guest’s maximum comfort. Kitchen, living room and dining room in each suite are integrated for entertaining and enjoyment. Designated suites meet Americans with Disabilities Act (ADA) requirements.In addition to captivating casino action, Las Vegas offers a wealth of entertainment opportunities designed to dazzle you and yours. Take a thrill ride on the Big Shot - the Stratosphere's thrilling 180-feet free-fall ride. Enjoy the sights of Las Vegas from the observation deck 50 stories above the Strip on the replica Eiffel Tower at Paris. Catch Cirque du Soleil at Treasure Island or one of the mystifying magic shows at the Venetian. You can also hike in scenic Red Rock Canyon, take a riverboat cruise on Lake Mead and learn about the inner workings of the Hoover Dam.